We love hearing from our clients after their pets have received treatment at a PetCure Oncology cancer care center. Looking at the photos and video updates of their furry family members always puts a big smile on our faces. It reminds us of why we do what we do and renews our motivation to continue revolutionizing cancer care for pets. Greg and Robin Voth’s beloved American Cocker Spaniel, Lucky, received stereotactic radiosurgery (SRS) at PetCure Oncology at Veterinary Radiosurgery and Imaging Center (VRIC) in Clifton, New Jersey to treat nasal cancer. 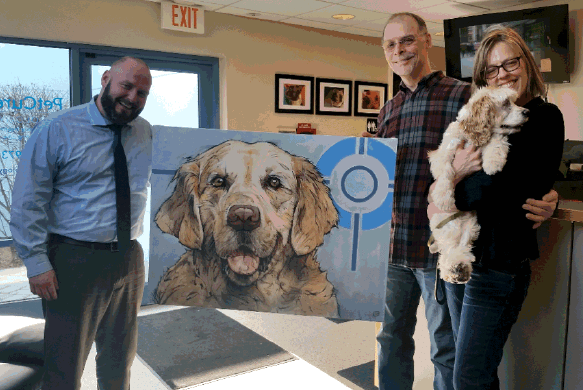 Not only did Lucky’s owners give us a wonderful testimonial, they also made us a special painting of PetCure Oncology’s mascot, Huck, painted by Lucky’s dad. “Hearing that our Cocker Spaniel, Lucky, has nasal cancer, was the blow of all blows. We spent the holiday season with the wind knocked out of ourselves. Frantically searching the area for an affordable CT scan and discovering PetCure’s Clifton, NJ location so close to home was nothing short of divine intervention. Who knew making a ‘cold call’ could bring such hope? We knew, without a doubt, that Lucky was in the best hands during his sessions there. 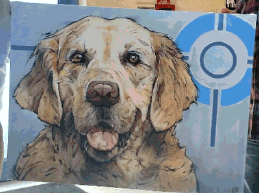 Thank you to Greg and Robin Voth for your kind words and beautiful painting. We also hear that Lucky just had his 13th birthday. Happy Birthday, Lucky! If you would like to share your experience with PetCure Oncology, please visit our Client Testimonials page. We’d love to hear from you!